Freshly squeezed on the West Queen West strip is a hip new organic vegan spot called BOLT Fresh Bar. I've heard nothing but amazing things and I've been meaning to make a lunch run over there but it never works in my favor due to my hectic schedules. However, last week I had the opportunity to sneak out of work to alas visit and indulge a little bit of BOLT heaven. I now understand the hype. Upon arrival, I was greeted with a friendly smile from all three staff and offered samples of their soup and smoothie of the day. Both were very delicious that I immediately responded with a 'MmMmMm...' followed by a shimmy and a little happy dance as a sign of approval. After sharing a few laughs with the staff and getting to know my new neighbors on the Queen strip, I decided to in fact go with the smoothie of the day which was the Greena Colada that consisted of: pineapple, shredded coconut, raw cashew, flax seed, kale, coconut milk and agave ($7). Since I cut meat off my diet, I've been eating alternatives to get my dose of protein so I decided to go with BOLT's Protein grain Bowl which contains a whole 'lotta goodness including: brown rice, bean medley, marinated tofu, crunchy sprouts, butternut squash, cherry tomato, pepita and carrot miso dressing ($9). For a full look at their menu click here. Overall, my first experience at BOLT was nothing short of spectacular! 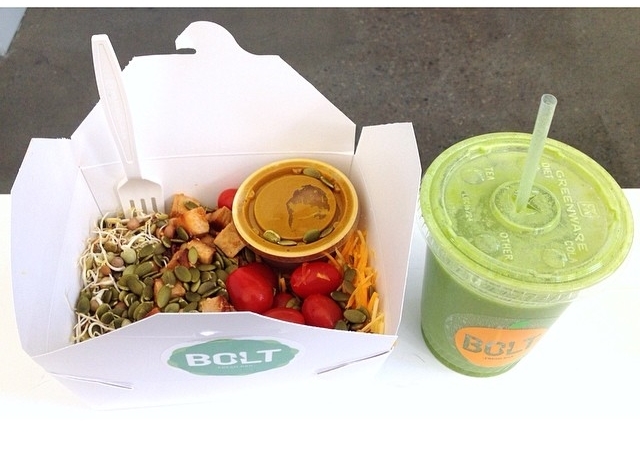 I highly recommend you bolt into BOLT and get yourself into a healthier eating lifestyle.